With films as memorable as O Brother Where Art Thou? and True Grit, I've come to greet any new Coen Brothers film with a certain level of anticipation. Their familiar brand of off-beat comedy is served up well in their latest picture, Inside Llewyn Davis. The film follows a week in the life of Llewyn Davis (Oscar Isaac), a struggling folk singer trying to make a living from his music in 1960s New York. Having been forced to go solo after his musical partner and friend committed suicide, Llewyn couch surfs among an eclectic set of friends (fellow musicians, his reluctant sister, intellectuals), struggles to earn even a meager amount for his singing, and is failing to deal with all life throws at him. From the opening shot of Llewyn performing a song from his set in a small music venue, I knew I was going to enjoy the film. The soundtrack is delightfully melancholy and sure to become a firm favourite. The muted colour scheme and simple long shots of the New York Streets create an atmosphere of nostalgia, without over romanticising it (I'd love to see Bruno Delbonnel pick up the Oscar for Best Cinematography). Llewyn may show skill as a performer (and I could watch Isaac with his guitar all day), but the sad truth is that he was just one of many mediocre artists who struggled to get a gig. Maybe the film is so refreshing because it addresses that sad question many artists have to face: when do you give up? 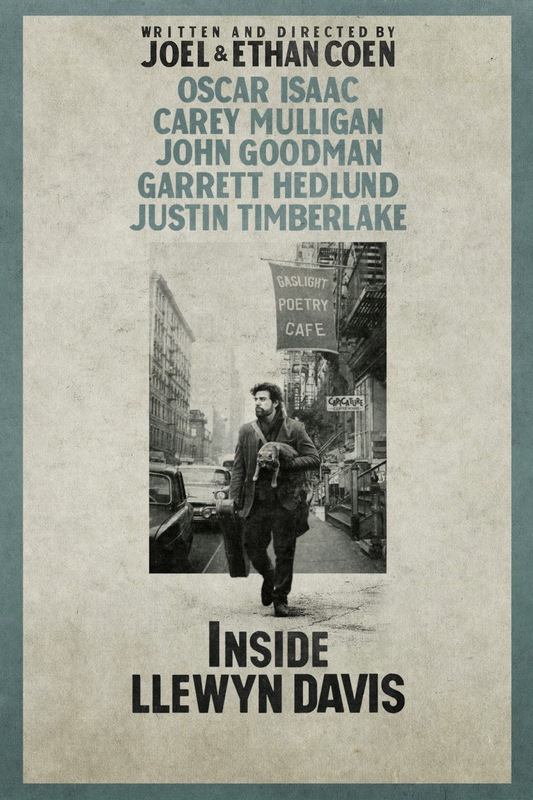 Inside Llewyn Davis is a wonderful examination of the folk music scene in Greenwich Village during an exciting period of history, and the supporting cast are impressive. A special mention ought to go to Carey Mulligan for her portrayal of Jean, a friend of Llewyn's (and former lover), who embodies the sense of frustration at his lack of success and drive. The story is underpinned by Llewyn's unspoken grief at the loss of his partner, as he brushes aside all mention of him. As I was watching, I found myself wanting some catharsis in the form of a confession from Llewyn. However, after the film concluded I felt that the Coen Brothers have nailed something about the ongoing nature of grief and loss, in their refusal to provide any resolution or closure. This is a film I highly recommend.